Part 2 of 3. Part 1 here . After ten years of a very long siege, along with raids in the area, a quarrel opposed Agamemnon, chief of the Achaean coalition, and Achilles, the most famous hero of his camp. Abusing his power, Agamemnon seizes Briseis “with the lovely cheeks,” the young captive loved by Achilles. Such is the pretext and the beginning of the poem: “Sing, goddess, of Achilles’ disastrous anger . . .” This goddess who sings the epic is the muse, whose interpreter is the Poet, which underlines his bonds with the divine world. In the grip of righteous indignation, after having copiously insulted Agamemnon, Achilles decided to abandon the battle and “retire to his tent” (a much imitated phrase) as did his followers (the Myrmidons). This anger of Achilles, principal hero of the Iliad along with the Trojan Hector, is the pivot of the poem. His withdrawal with his men had very serious consequences for the Achaeans. Victory is abandoned. In the plain, under the walls of Troy, they will suffer three increasingly disastrous defeats. The attackers are put on the defensive. They must even build a fortified camp around their ships. This retrenchment was then attacked by the Trojans, led by Hector, the most famous son of Priam. The enemy managed to set fire to the Greeks’ vessels and push them to the sea. Throughout these hard battles, which fill the poem with carnage and exploits, the absence of Achilles is nothing but a sign declaring his force and power. The bravest of the Achaean chiefs—massive Ajax, impetuous Diomedes, skillful Ulysses—vainly try to replace him. One night of black tragedy, between two disasters, while Achilles, in his tent, putrefies in the inactivity to which he has condemned himself, he sees the approach of an embassy led by the two great leaders of the army, Ajax and Ulysses. With them is the aged Phoenix, who tries to make him hear the voice of his father. In the face of the danger, Agamemnon repented. He returned Briseis and offered sumptuous gifts in reparation. The embassy fails. Achilles, wallowing in resentment, put himself at fault in his turn (Book IX). The following day, the Trojans forced the defenses of the Greeks. Hector set fire to a ship. At the other end of the camp, Achilles saw the rising flames. In spite of his obstinacy, he could not remain deaf to the pleas of his fried Patroclus, his other self. He sent his troops into battle, dressing Patroclus in his own armor. This counterattack drives back the Trojans. But Patroclus is killed by Hector. Achilles’ grief is terrifying. But it brings him back to life, unleashing a fury and rage of vengeance against Hector, murderer of Patroclus. Thus there is a complete reversal of the dramatic action that had been frozen by the withdrawal of Achilles. Maddened by pain, the Achaean hero returned to combat: “Like a vast fire, raging through the deep valleys of dry mountains, burning the forest, driven in all directions by the whirling wind, Achilles leaped in all directions. He went forth, like the night . . .” (Book XVIII). After a fierce duel, he killed Hector, then stripped his body and dragged it though the dust behind his chariot. For Achilles, to the pain of the death of his friend was added the certainty of his own fate. An old prophecy warned that he would be killed as soon has he took Hector’s life. Achilles always knew it. Unlike the other heroes killed in battle, he knew his destiny in advance and chose it. He does not submit to fate in Oriental fashion, he faces it. As a young man, he was offered the choice of a long and peaceful life far from strife, or an intense life cut short in the flash of battle. He chose the latter, bequeathing to the men of the future a model of tragic grandeur. Free of illusions, he knew that he will not have another life: “A man’s life,” he says in Book IX, “does not come again; one can never grasp or seize it again once it has escaped one’s clenched teeth . . .” It is a thought that speaks to us today. Compared to the sacred texts of other peoples and cultures, the freedom and sovereignty of the heroes of Homer are unique. Admittedly, the gods intervene in the Iliad, at fortunate and unfortunate times, but without really canceling the autonomy of men. Their many interventions do nothing but precipitate what would have happened anyway. And it really seems that Homer does not take them completely seriously (except perhaps Athena), which scandalized Plato’s stilted and moralistic sensibility. In reality, the gods of Homer are allegories of the forces of nature and life. The last Book of the Iliad is a drama of reversal: when the aged Priam comes to beseech the return of the body of Hector, his son, one sees Achilles allowing himself to become more and more susceptible to compassion. Transformed by his own suffering, the hero appears more complex than his wild violence let on. There are more than heroes and warriors in the Iliad; there are also women (Helen, Hecuba, and Andromache), children (Astyanax), old men (Priam). There are more than just brave men. There is Paris, whose strange love of Helen is the origin of the Trojan War. Carrying out the will of Aphrodite, he was the seducer and the kidnapper of Helen. Unintentional author of the war, he also brings it to a close by killing Achilles with a treacherous arrow, an episode that the Poem does not report, which is suggested only by the prophecy formulated by Hector at the moment he dies (Book XXII, 359–60). Paris, the often cowardly and conceited fop, is the opposite of his brother Hector, whom he deceives. Hector is the pure hero, the guardian of Troy, whereas Paris is the “plague of its fatherland.” Helen, the woman he seduced and abducted, scorns him and does not fear to rebuke him: “You have returned from battle! You should have died out there, under the blows of the strong warrior who was my first husband!” (Book III, 450–55). She detests him, but, by the will of Aphrodite, she is controlled by his sexual magnetism. Once again, Homer does not explain, he tells, and what he says is full of complex truth. Helen is the opposite of Paris. She is moral, her lover amoral. 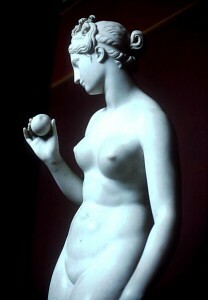 She revolts against the physical submission to him imposed by Aphrodite. Her nature was made for order. She always regrets leaving her old life: “I left my bridal room, my close relations, my cherished daughter. . . . I languished in tears.” Nothing predisposed her to take the role of adulteress, instrument of the ruin of two peoples. Nothing, except the intervention of the gods, in other words, fate. With a great and moving truth, the Iliad thus shows several antagonistic natures, Helene and Paris, Achilles and Hector. Awakened by the death of Patroclus, the Force rises: “Achilles rose . . . . A great brightness radiated from his head to the sky, and he strode to the edge of the ditch. There, upright, he let out a cry, and this voice caused an inexpressible tumult among the Trojans” (Book XVIII). Homer implicitly sympathizes with Hector. This Poem of the Achaeans thus treats their principal enemy as an exemplar. Is there any equivalent to this nobility in our national epics or the holy books of the Near or Far East? Though he is as brave as Achilles, Hector’s courage is not blind. He is the very incarnation of stoic courage. He is not immune to fear. But he conquers it. Even though he knows that all is lost, he fights to the limit of his endurance. Hector is also the incarnation of patriotism. For him, honor merges with duty. He is ready to die, not for its own glory, but for his country, his wife, and his child. He will defend them against all hope, because he knows Troy is lost. The moment before, Andromache begged Hector not to go. She does so no longer. She understands that he defends their freedom and mutual affection. In this last conversation of two spouses, there is something unique in all ancient literature: a perfect equality in love. One never ceases discovering the incomparable richness of the Iliad, which concludes with the preparation of Hector’s funeral. The death of Achilles and the “Trojan horse” are briefly evoked only in the Odyssey (Books XI and VIII).